A 'best of' compilation of recent Neve designs in a top quality package with a price tag to match. Stunning signal quality. Superbly versatile EQ. Intuitive layout. The Portico II provides stunning audio quality, and hugely impressive EQ versatility. The Portico II is like a sort of 'best of' compilation of recent Neve designs. The Portico II literally expands the excellent Rupert Neve Designs half-width range in the form of a full rack-width 2U channel strip. It provides a mic/line/DI preamp, four-band EQ and compressor; each as comprehensively featured as many standalone units. On the outside the cool, clean aesthetic is coupled with a distinct lack of compromise on material and engineering quality, from the smooth knobs to the extra thick aluminium front panel. "The Portico II has many aspects that live up to the Neve name, but the EQ impresses us the most." On the inside much of the circuitry is based on the 5088 console and carries many Neve hallmarks, from the all discrete bespoke RND op amps to the transformer-based input and output stages. The power rails run +/-36V that creates exceptional internal headroom to allow for high gain inputs and extreme settings without distortion. The preamp gain is split into two main controls: the stepped Mic Gain (66dB in 6dB steps) and the Trim (+/-6dB). There is no pad control, but considering the amount of headroom available, it's hard to imagine any sources managing to overload the Portico II. The DI input is paralleled with a 'Thru' jack for passing the instrument on to amps, pedals, etc, an oft-ignored yet vital function. The 3M DI input impedance is significantly higher than average which, coupled with the FET amplifier circuit, translates into a truly impressive instrument preamp. Bass guitars, synths and even pedal re-amping sounds full and crisp with more clean gain on tap than we could ever use. This behaviour is not restricted to the DI input, and having tried a wide selection of mics, including some picky and awkward vintage pieces, we are very impressed by a combination of characteristics. The ample gain and excellent phase linearity brought forward the clarity and depth of all the mics we tried. Fast transient performance is coupled with a seemingly flat frequency response to both extremes of the audible range allowing sources to be revealed with a natural fullness. There is a thickening quality in the low mids that could be described as 'forward', but to me it sounds like the kind of clarity that only comes with low intermodulation distortion and minimal phase shift. Between the preamp and EQ sections is a steep (24dB/octave) high-pass filter which can also be assigned to the sidechain (there are send and return jacks for sidechaining the compressor externally too). This HPF is highly effective in LF artefact removal with no evidence of the resonance or phase shift which can accompany sharp cutoffs. The EQ has four bands: LF and HF peak/shelf, LMF and HMF parametrics. The HF and LF are independently switchable while the two mid bands share a bypass (the EQ can also be bypassed as a whole). 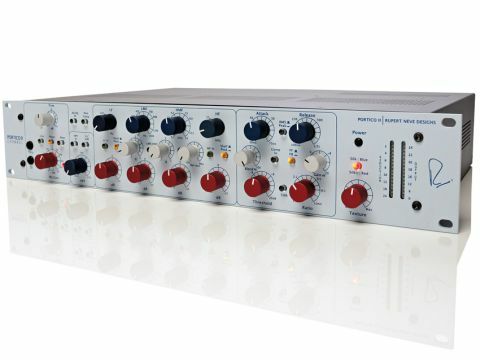 Though the Portico II boasts many aspects that live up to the Neve nametag the EQ impresses us the most. The LF and HF shelving EQs are extraordinarily well implemented and can be used for the subtlest tone setting. The 15dB of cut and boost is more than enough, but thanks to the massive headroom extreme settings can be used without devastating the source. In combination with the mid bands truly elegant and creative tone sculpting can be achieved. The bonus to the EQ is the presence of a de-esser, which is tied to the HMF band frequency and Q settings. There is a single 'Off/Max' knob and an LED to indicate gain reduction. Though this works very well on vocals it also does a great job of clamping various forms of mid presence for mix placement. The mid bands have so much range that we rarely used the LF and HF bands in Peaking mode, instead using them to shelve the tonal 'scene' while sculpting with the mids - joyous! The compressor section is no less impressive and features more dynamic control than many dedicated units. Alongside the Threshold, Ratio, Attack, Release and Gain are three less common, yet highly useful controls. The first is an RMS/Peak level sensing switch. In RMS mode the Attack/Release settings follow the averaged signal level as normal, but in Peak mode a fast (0.1ms) Attack is switched in along with a combined RMS/Peak level tracking. The Peak mode is a little vicious to use at low thresholds, but used to capture excessive transients, it does a fine job. The Blend control allows the compressed signal to be mixed with the dry original and thus operate as a parallel unit. The third standout feature is the FF/FB switch which really expands the range of compression character. The Silk function on the Portico range preamps is included here, but with its harmonic adjustment abilities expanded in two ways. Firstly there's a Texture control that allows the Silk level to be dialled in. Secondly there is an alternative tonality and character in the form of Silk+. Standard Silk mode brings in a LF/LMF frequency enhancement that adds a weight that could be referred to as 'warmth', though without the fuzziness this adjective often implies. The Silk+ is much more akin to standard harmonic distortion, though kept solely to the HMF/HF range no matter what the LF/LMF content. Both forms of Silk are useful for adding extra thickness/presence to a source without trashing the essential clarity. Rupert Neve and his little pixies have created such iconic units over the decades with many defining a sound that engineers keep reaching for. From this incredible stable comes the Portico II and its lineage is tangible in both sound and design quality. It may not be a 1073 or a 33609, but it does package up the essential channel strip components with a combined quality and range that is hard to beat, even with separates. It is expensive, but there is a very decent reason for this. For us the stunning and versatile EQ in combination with the sheer quality of signal path (volts, oh lovely volts!) are reason enough, but add in the impressive range of compression and limiting options, the full-fat preamp and the two Silk options and the Portico II starts to look quite reasonable. Definitely an investment in quality.